Considering the movie’s backdrop is mid-90s New York, D-Nice’s mixtape drops a healthy dose of East Coast classics in this lean, mean 24-minute mix. In the meantime, Z-Trip is staying busy with his usual assortment of remixes and collaborations. 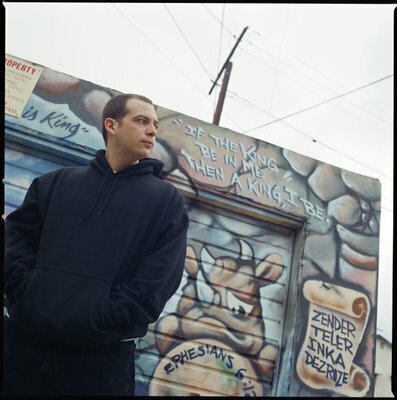 One of his more intriguing projects that I was totally unware he was involved with is a remix of scored music for the 2005 film Infamy, a documentary that follows seven people immersed in the graffiti subculture. 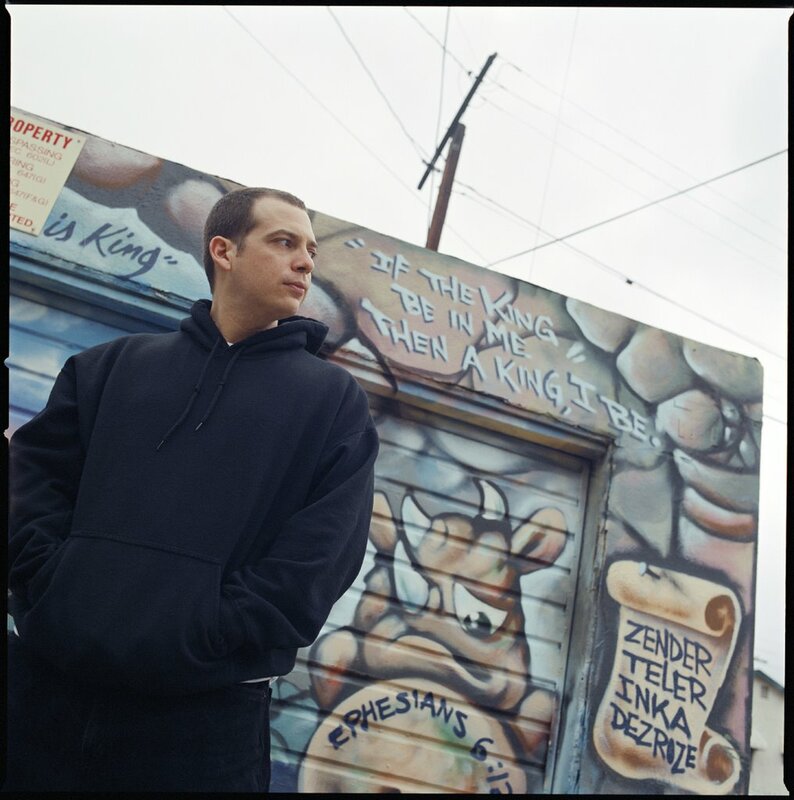 It’s directed by Doug Pray, who is responsible for the excellent DJ documentary Scratch, in which Z-Trip is featured prominently. As part of the tweaking at his Web site, Z-Trip will be making music and videos available for download. His remix of the Infamy movie theme is the first. Grab it! It’s not a stretch to consider it a coming-of-age film, which is a major reason I attached such importance to it. Like so many great albums (Built to Spill’s Perfect from Now On and Richard Buckner’s Bloomed to name but two), Kicking and Screaming was very consoling in those awkward “What-shall-I-do-with-my-life” moments prior to and shortly after graduation. It’s not quite as dramatic as it sounds, but nothing is so forgiving and comforting as a movie or album that seems to reflect your own place in life. For me, that meant traveling to Milwaukee (“Live in Milwaukee. Live … in … Milwaukee”) for an internship after graduation, pondering where I’d end up in a newspaper business that encourages “paying dues” (i.e., working in Smallville, USA, or, worse, Lubbock, Texas) and being miles apart from my then-girlfriend (who is now my wife; so I guess that worked out, eh?). In Kicking and Screaming, the main character, Grover (Josh Hamilton), is job-hunting and trying to cope with losing his girlfriend, who has left to live in Prague. (“Oh, I’ve been to Prague.”) On top of that, his parents are in the middle of a divorce, a topic that Baumbach revisits in The Squid. My patience is such that I rarely watch the same movie over and over. Yet I’ve seen Kicking and Screaming at least no less than 10 times. (That’s not including endless times citing lines from the movie ad nauseam, a habit that is reflected on the DVD cover, so I must not be the only one.) I think it was one of the first pieces of art in which I realized a movie or a song or an album can be something more than a cheap form of entertainment. It’s a movie driven by the strength of its dialogue and context. Obviously, a 16-year-old in high school won’t derive the same meaning from it as a newly graduated 20-something. 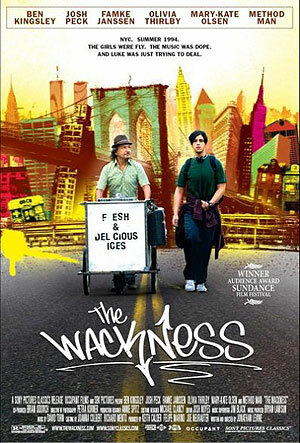 That said, the writing, full of intelligent, sarcastic wit and wry humor, can be appreciated no matter the circumstance. While in Milwaukee, I distinctly remember having very lengthy e-mail discussions with my brother, who was going through a bit of transitional period himself by moving to Boston for law school. A few days later, I got a package from him. He sent me his copy of Kicking and Screaming (on VHS, of course) with a note: “Sounds like you need this more than I do.” I still have the tape (and probably the note). 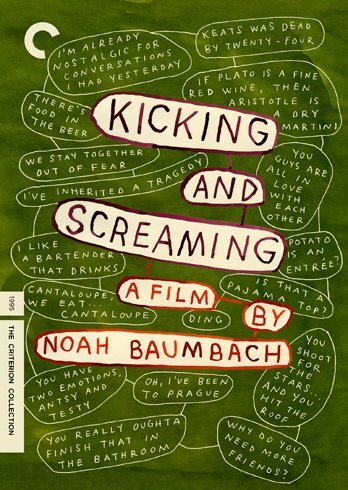 I also remember signing an online petition at a now-defunct official Web site for Baumbach (www.noahbaumbach.com, if I remember correctly) pleading for the movie’s release on DVD. This has been a topic among friends of ours literally for years. With so much garbage on DVD, how could they not release Kicking and Screaming? Perhaps it took a movie like The Squid and the Whale for someone to backtrack and appreciate Baumbach’s catalog (K&S was his directorial debut). Whatever, I’m confident this will be worth my wait. Features include an assortment of goodies: deleted scenes, interviews, director-approved digital transfer, theatrical trailer, etc. One final point: I absolutely resent that every time someone asks me what my favorite movie is, I have to qualify it by saying, “No, not the Will Ferrell Kicking and Screaming.” How can a movie title be so easily copped like that with no respect to the original? Anyone have answers? Pre-order Kicking and Screaming (the good one) at Amazon. Best news of the day: A Transformers live-action movie will be released in 2007, according to this story. The movie will be directed by Michael Bay (The Rock, Pearl Harbor, Armageddon) and Steven Spielberg will executive produce. Go here for the Transformers Web site. There’s only one problem with this: It’s preying on my nostalgic tendencies, which is exactly the reason I broke down and bought one of the Transformers seasons on DVD. In reality, I think I’ve watched about two episodes. The cartoon is never as good as it was when you were a kid. Yet it never fails when I browse DVDs: I see the Transformers series or G.I. Joe (“And knowing is half the battle”) and I just have to have them, although I flinch at the cost. We pay the price for nostalgia, I suppose. On that note, anybody remember the wannabe Gobots? Weak. Check out Del (feat. Unicron, named after a Transformers character, which is actually just Del with his voice sped up) on Worldwide. I thought I had a Souls of Mischief freestyle with an Optimus Prime reference. You’ll have to settle for probably one of the best hip-hop B-sides, Undisputed Champs (feat. Q-Tip and Pep Love).